We believe the bedroom should be a sanctuary for the senses creating an environment that is welcoming and tranquil. Few things in life are more comforting than a peaceful night’s sleep. Now imagine basking in sensuous silks or sateens, exquisite linens or long staple Egyptian cotton sheets. We have hand picked our suppliers for their consistency in quality of product and variety of styles and fabrics. We have individual pages for each of these bedding suppliers but this will help you in your search. We are always available by email or telephone to help you with your bedding needs, please do not hesitate to ask, no question is too trivial! Bella Notte – beautiful line of bedding hand dyed to order and made in California, this is a specific style of bedding available in plush velvets, cottons and a wide variety of linens. 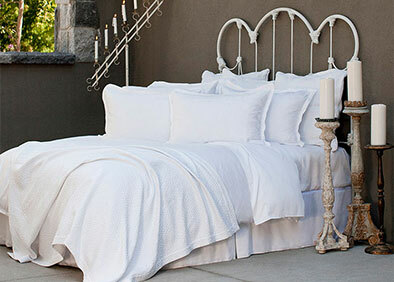 Coyuchi – a new supplier for us from the United States that has only organic bedding. Sheets and duvet covers are available in linen, jersey, percale cotton and sateen cotton. We also stock down duvets with organic cotton covers. Cuddledown – Egyptian cotton milled in Israel and made in Ottawa, Ontario, these prints are a beautiful transition for the price conscious customer that wants to start acquiring well made linens. Cuddledown also makes Suprelle pillows (a substitute down product) which are a favorite among our vegan customers. Designer’s Guild – new to Shades of Sleep in January will be Designer’s Guild, a bright colorful soft cotton bedding line from Britain. They also have luxurious accent pillows and showers curtains. Frette – made in Italy since 1860 we are pleased to be carrying Frette sheets in Hotel Collection, Single Ajour and Doppio in white and cream in the store together with crisp duvet covers in white and cream. As we are able to order this product from New York we find we are able to replenish stock fairly quickly. Latierra – we are pleased to now have in the store Alpaca Duvets made in Peru from this Canadian Company. Libeco Home – Shades of Sleep is now the exclusive dealer in Calgary for Libeco Home, a wonderful linen line grown, woven and sewn in Belgium. Luxeport – an Edmonton Company that provides us with silk duvets in light and heavier weight together with silk pillows for that specific customer. Revelle – Egyptian cotton bedding milled in Italy and sewn in Toronto, Ontario together with Egyptian cotton prints at a lower price point milled in Israel, this supplier has a large selection of products to choose from. St Geneve – beautiful jacquard prints, soft sateen or modal sheets, crisp percale all made from Giza Egyptian cotton milled in Italy and sewn in Vancouver, British Columbia. St Geneve also has a wonderful selection of down duvets and down pillows as well and as their down pillows are a customer favorite we always have stock in the store ready to purchase together with Lajord down duvets.